April 8, 2019 : Dow Jones, SP500 and Transportation Index are expensive = TOP ! When the money supply is growing faster than nominal GDP, then excess liquidity tends to flow into financial assets. However, if the money supply is growing more slowly than nominal GDP, then the real economy absorbs more available liquidity. That’s one reason why stocks go up so much when the economy is weak but the money supply is rising. It makes no sense to buy-hold US-stocks once the US-Dollar resumes its Bear Trend! Dow Jones industrial: Stocks are SAFER than Bonds and LONG TERM when we have QE4 I see a Dow Jones of 30,000 and higher...! The Dow to geyser to 30,000 and higher...that is after this correction is over and we have QE4 (Hyperinflation). Jan 8, 2017: is the Correction due January 20? Jan 9, 2018: Buy Climax?= DANGER...see TARGET on PF chart. Sep 13: worst case scenario we have a M-top formation. Oct 30 - Nov 11 - Nov 20: look out below. Feb 15 - April 8: running into HEAVY resistance. July 14 - August 22: BREAKOUT ! 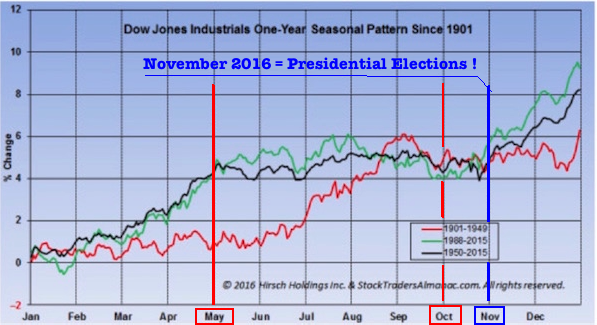 Jan 8, 2017: is the Correction due January 20 ? August 11: correction starts EXACTLY at level where it says SELL op our PF chart. Feb 3: the beginning of the expected correction. Sep 13: ALL TIME HIGH. Jan 8, 2017: Resistance of the All Time High. March 19: Bearish FLAG...but Support level will probably hold and we shall see higher levels. Aug 11: correction starts EXACTLY at level where it says SELL op our PF chart. Jan 9, 2018: Buy Climax?= DANGER...see TARGET on PF chart..
Oct 15 - Oct 26: Technically still an uptrend...however EXTREME CAUTION is required as 200 day Moving Average has been broken. SUPPORT is 7,800! CENTRAL BANKS BUY SHARES...and they just have to print more money to buy more shares! Important is to understand that the bullish action indicates we have a HYPERINFLATION situation on hand and if confirmed, stock markets will rise A LOT MORE. This will become clear once the Stock markets indexes break lose from the actual resistance levels and we have positive backtests. Stay away from RED FLAGGED markets - some will continue to bottom; for others we shall see a break- down each time the local Bond market crashes!!! Get out of the European stock markets in distress: Greece, Portugal, Italy, Spain, France,...but remember at all times that HYPERINFLATION and communicating financial vessels can reverse the trend of ALL stock markets overnight. Some stock markets are a NO-GO because of the currency risk. Ex. Japan,..
RED flagged markets are in a SELL mode... RED - 0 - on the PF Candle charts show middle term bearish target . GREEN flagged markets are still in a Bullish mode and/or have completed their backtest and/or broken out and resumed their uptrend. Breakout STALLS - look out below.. Oversold - don't buy: currency risk! Once capital controls are enforced, the stock market will behave in a similar pattern as the SA-Dow. The Footsie is a secondary escape route for capital leaving the European continent. Remember that London is a Tax Heaven and the city will continue to attract capital. Especially so if the Brits decide to go for the Great Escape (BREXIT). The least we can expect is sidewards bullish action until Hyperinflation breaks out and the index soars to the upside....The same rule applies here as for the Dow Jones and the Nikkei: it's doesn't make sense to buy/hold shares when the currency comes down! Remember that so as the FOOTSIE goes, so goes the Dow Jones. Mar 10, 2018: Important is that the 6,800 level holds and the Foorsie bounces up after hitting it. BULLISH potential is 50% to 500% - use Trailing Stops and BUY during Corrections and Panic Situations ! Summer 2017 we had a new all-time highs in the S&P 500 . We have a lot higher to go from here(after the correction). The next leg up will be broad-based among many sectors, and investors should begin to accumulate. Note that gold and stocks can both go up at the same time. Only the Gold miners will go up at a faster pace. The worst case scenario and actual Target of the correction for the Dow is 14,200 & SPX target is 1520. The bullish targets are exponentially higher. We have extremely strong stock markets. AMAZING in times of recession. But a NORMAL consequence of Money Printing (QE). Markets will continue to go up as long as fresh money is created...and providing there are NO accidents. Be patient and use trailing stops - Use corrections to accumulate more common stocks, but don't exceed the proportions as set in the Investment Pyramid. Designated EUROPEAN STOCK markets (see below) are possibly building a long term bottom..others sit in a bull trend ! The Chinese Stock and Japanese stock markets must be followed up closely....The Japanese Printing press is doing overtime and the freshly created fiat money is spilling into the Japanese stock market. But the Nikkei won't make up for the weak yen. [Japan's PM has vowed to double the money supply]. November 2014, the Chinese Stock Market Index has broken out ! More QE or money printing for the EU, JAPAN and the USA...Because we have communicating financial vessels (see Investment Pyramid) the freshly created capital will continue to seep into the stock markets . The more fiat money, the higher markets! Best performing market is the Johannesburg Stock-Exchange, Caracas (Venezuela) and the Iranese stock exchanges. Stock markets in the USA are poised to raise more....that is until the Printing Press stops...or we have an accident! Capital fleeing RED Europe will push up north-American markets to record levels and the pressure of freshly created fiat money can be so big that te Dow Jones could well be flying to 30,000 and higher. Important is that certain European Markets are poised to keep sliding or (best case scenario) will move sidewards while bullish markets it will be for the North- American markets (USA and Canada). It's readily apparent what effect the trillions and trillions of Dollars, Yen's and Pounds central banks have pumped into the system is having on shares. Add to this Capital which is increasingly fleeing Europe and buying American. Basically all stock markets should be crashing under the pressure of the Deleveraging as a consequence of the financial problems the Western World is in, but Authorities are doing their best to avoid a crash of Stock Markets by pumping up Money Supply into Infinity. Currency controls: when Capital is not allowed to leave the country because of capital controls and investors stop trusting Authorities, STOCKS are often the best way to preserve savings. This is what we had in Zimbabwe and have in South-Africa and Tehran (Iran). Do know that Authorities have an unlimited amount of Fiat money to play with and that there are over $ 1.4 quadrillion DERIVATIVES which can be used to scare fiat money out but also into Shares, Gold, Silver and Commodities. (and options to buy it) or Treasuries. I assume that similar techniques can be used to keep the stock markets happy. However one may never forget that the ULTIMATE LOCATION where the authorities want your money is in WORTHLESS FIAT TREASURIES and FIAT MONEY (bank deposits, saving accounts. treasuries). This is what the SP500 may look like over the coming years. I expect the index to continue to rise to new records UNTIL we have a serious correction or the Great crash of the 21st century. From now on Gold will continue to perform better than the Dow and Stocks!...mind the bearish wedge....it has been activated and means Stocks Markets will come down and the Gold & Silver sector will go up! There is no doubt equities are a lot safer than Bonds. For those who seek income and stability and refuse to affect a larger part of their savings to the Gold/Silver and Energy sector, we have opened an RECESSION PROOF section. All shares in that section have become very expensive! The Markets are NEVER wrong.The trick is to be patient enough to listen what they are saying. Markets are a WARNING for what is to come: high volatility as insecurity grows! QE III in the EU and the USA has broken the negative trend of most Western Stock markets. But the question is whether it will last? QE will have a favorable impact on most European Stock Markets as it may avoid further weakness....on condition Capital stops leaving the EURO-ZONE. Best case scenario Stock markets are about to rise expressed in Nominal terms only....because of the Hyper-inflationary depression. But we may see some corrections BEFORE this happens. If and when the credit rating of the USA is lowered, we expect a crisis in the Bond market which will temporary infect the Stock markets. A crashing Bond market, a weaker and/or crashing Fiat currency, a weaker stock market and stronger Gold. This what the citizens of a country will see each time the system starts to fail...until Hyperinflation sets in. When Governments are failing, you sell their Bonds and buy Real Assets or Stocks preferably in some safer country. In our opinion, if something does go wrong, the Chinese and Indian markets won't be able to withstand negative Western world stock markets. After all they are subject to the HOCGood (high order capital goods) rule.